I finally, finally made a recording I like of my harp tune, "Hedgerows and Fences." I wrote it years ago, when I was new to the harp, and when my harp teacher heard me struggling through it the first time she said, "Why do you write such difficult pieces for yourself? You should start with something easier. It's going to take you forever to learn to play that." And then my harp teacher laughed at me and said, "But you're going to be famous someday." My parents came for a visit last week. 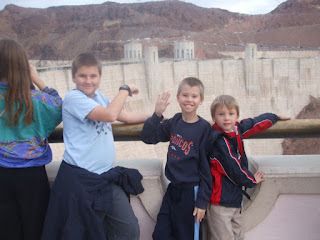 On Friday we took them to Hoover Dam. Or maybe they took us, since they paid for the tour tickets. We took an elevator five hundred feet down into the canyon wall. Deep underground, water seeped through the porous volcanic rock, leaving sparkling white mineral deposits on the damp walls. 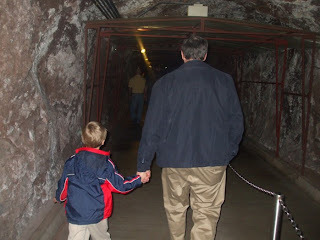 Our tour guide led us down a tunnel and under a “Fallout Shelter” sign. Fallout shelter? My science-fiction-writer brain began clicking. Fifty people are on a tour of Hoover Dam’s hydroelectric plant when a nuclear bomb strikes Nellis Air Force Base. Trapped in the fallout shelter five hundred feet below the surface, what will they do? Who will become their leader? Will they open the door for the next tour group even though there’s barely enough room for them as it is? Can they still use the fifty-year-old food and water stored down there during the Cold War? Will any of them leave to find family and friends in spite of the deadly radiation sifting down over the Las Vegas Valley? How will they pass the time for the next two weeks while they wait for the deadly radioactive isotopes to decay? Pictionary, anyone? 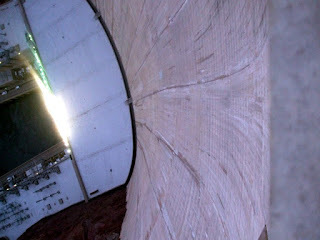 I admired the huge water pipes that feed the hydroelectric plant, and the massive spinning turbines in the power house. Then we took the elevator back up to the museum. My favorite part of the day was watching the time-lapse photography of the dam rising up from the canyon floor, like a weird grey fungus climbing the walls. 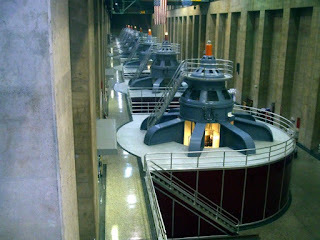 In the museum they have a huge cement bucket like the ones that poured the dam, and a cut-away of an electricity-generating turbine you can walk right through. Wow! I also loved the big star chart in the terrazzo marble tiles surrounding the dedication monument. Maybe some distant future archeologists can decode the English language using that star chart. The tour guide told us that the dam is expected to last for two-thousand years. At that time it won’t be the cement starting to break down, it will be the silt buildup behind the dam that will be a problem. I wondered what it would be like to come back in two-thousand years and see what is going on. I wonder if they have a plan to deal with it. I guess that doesn’t make sense. By then the technology may be so advanced, there will be ways to solve the problem we haven’t imagined yet. Or else so reversed that there’s nothing we can do. While we walked along the top of the dam and admired the view down to the roiling river below, my dad told me that my very own great-grandfather had been here during the construction of the dam. Farming wasn’t so good up in Overton in the 1930's, so great-grandfather had come down to Boulder City and opened a dairy to supply the dam workers and their families with milk. As we drove away, craning our necks to get a last look at the new bridge under construction high over the dam, I felt mighty proud to be a human being. We do things! Big things! I wondered if our nation could get together and do a big project like that now. I looked up at the new bridge again, and answered yes. This has never been a happy, bubbly blog covered with cute pictures of kids smeared with frosting and cookie crumbs. I'm sorry my last two posts were depressing. I was practicing my writing, trying to describe exactly how I felt at a particular moment. Most of the time I feel happy and contented. Really I do. I took those posts down. This is a public blog, not a personal diary. I'll behave from now on. I know this is a little late, but for Valentine's Day I wanted to show everyone how to make Chocolate Raspberry Trifle. You'll need a few saucepans, two 8 inch round cake pans, and one eight inch round trifle dish. In a large bowl, beat the eggs with an electric mixer for 4 minutes. Add sugar and beat for another 4 minutes. Sift in flour and baking powder, and beat just until combined. In a small saucepan, heat the milk and the butter until the butter melts. Add the milk mixture to the bowl, and beat until combined. Divide the batter evenly between two greased and floured 8 inch cake pans. Bake at 350F for 20-25 minutes, or until a toothpick inserted in the center comes out clean. Let cool for ten minutes, then remove the cakes from the pans. Combine eggs, milk, sugar, cornstarch and salt in a heavy saucepan. Cook and stir over medium heat until the mixture is just about to boil. Remove from heat and stir in chocolate chips. Combine raspberry jam, water, and sugar in a medium saucepan. Sprinkle Knox gelatin over the mixture and let dissolve for one minute. Heat and stir until steamy but not boiling. Remove from heat and add frozen raspberries. If you want to CHEAT you can use raspberry jello instead of jam and Knox, but then your trifle will taste like artificial raspberry flavor. Tastes as sweet as Valentine's Day! Check it out! My extremely awesome brother Jon is featured in the magazine mormonartist. You can read the article here. You can also scroll down the sidebar to find links to his artist blogs. I'm all worn out. I spent the morning driving all around town trying to figure out how I was going to mail 226 sheets of white office paper to New York. Yes, this is a happy problem to have. But it wore me out. So it is extra lucky that I already have a nice blog post for today ON ANOTHER BLOG. My good friend Beth Revis invited me to guest blog for her today. Go check it out! My guest post on "writing it out"